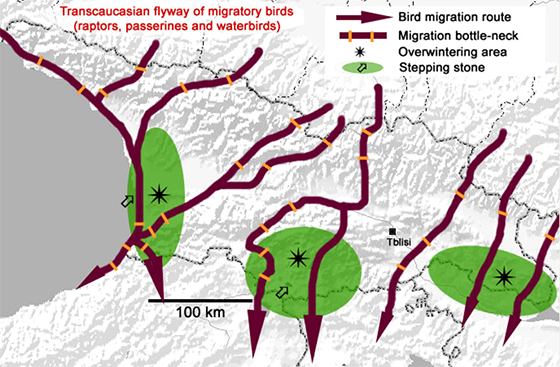 In 1999 a study into the importance of a migratory bird flyway along the Georgian Black Sea coast (in the Caucasus) was initiated by Erwin van Maanen et al. (1998; 2001a & 2001b) as part of the development of a biodiversity center in the harbor town of Batumi and the advancement of nature conservation research and management in the Caucasus. This was achieved under the Black Sea Environmental Program and in collaboration with the Georgian Center for the Conservation of Wildlife (GCCW). The study was based on earlier accounts on the importance of raptor migration and the shooting and trapping of raptors in the foothills along the eastern Black sea coastline of Turkey by Gernant Magnin (1989). The initial study on the Georgian side of the border revealed that the coastal fringe of the Adjaria-Imereti mountain range, in a north-south trajectory, is indeed of great importance as a migratory route and bottleneck for a great diversity and tremendous volume of birds, in particular birds-of-prey. In terms of volumes and diversity of birds, it exceeds other well-known passageways along the Mediterranean, like Gibraltar and the Bosporus (Van Maanen 1998; Van Maanen et al. 2001b). 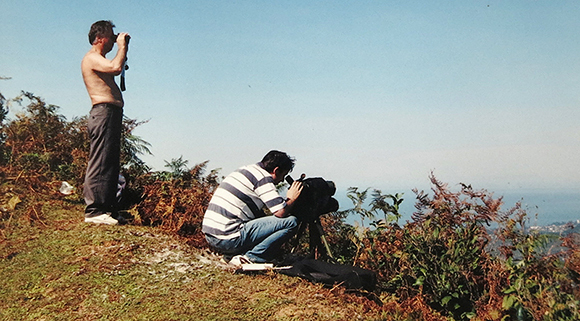 The first counting of raptors flying through the Batumi bottle-neck in the fall of 1999 (Rezo and Irakli Goradze of the Black Sea Biodiversity Institute at the time). The Batumi bottleneck is part of a larger flyway across the Trans-Caucasus, with other but smaller concentrations of, or stowed bird migrations across inland regions. These are dictated by mountain ridges and valleys, including for example the Zekari pass in the lesser Caucasus and the Dariali Gorge in the Greater Caucasus (Van Maanen et al. 2001b). The Black Sea in combination with the lush subtropical foothills, which in the hot and humid fall produces warm updrafts or thermals, present an energetically ideal gateway for passive migrants like soaring birds-of-prey (for example thousands of Honey-buzzards Pernis apivorus), but also to countless more active flyers like Accipiters, harriers and falcons and other birds like rollers, bee-eaters, orioles, nightjars and quails. Over the coastal Black Sea and the lowland plains, including Kolkheti Wetlands, a wide range of other birds may be observed passing low overhead or resting; including rarities. 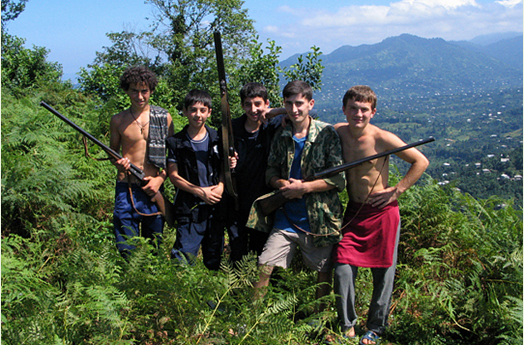 A select potpourri of raptors observed in the Batumi foothills in the fall of 2012. 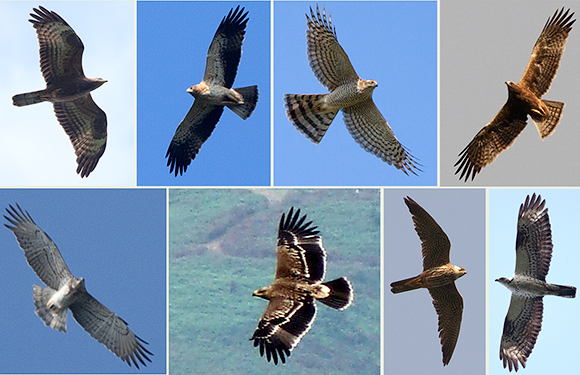 Left-right/top-bottom: Honey-buzzard (juvenile brown morph), Booted eagle (Aquila pennata pale morph), Eurasian sparrowhawk, Booted eagle (dark morph), Short-toed (snake) eagle (Circaetus gallicus adult), Eastern imperial eagle (Aquila heliaca juvenile; photo by Jimsher Mamuchadze), Hobby (Falco subbuteo adult), and Honey-buzzard (adult male). Actually, the significance of the migratory flyway was already known and reported during the Soviet era (Abuladze 1994 & 1997) and even before (Villkonskii 1897). For a long time it remained unknown and unappreciated in the West until more European birders started to visit and explore Georgia in the last five years. Before that several conservation initiatives were undertaken by the GCCW in partnership with BirdLife International, facilitated by Erwin van Maanen from EcoNatura. 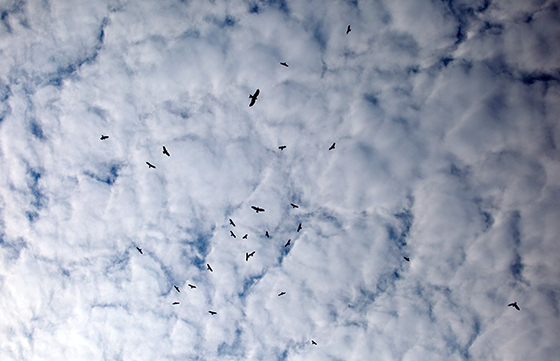 Wave after wave of thermically rising and gliding raptors (here a flight of black kites and steppe buzzards) once again observed on a hilltop near Batumi in the fall of 2012. 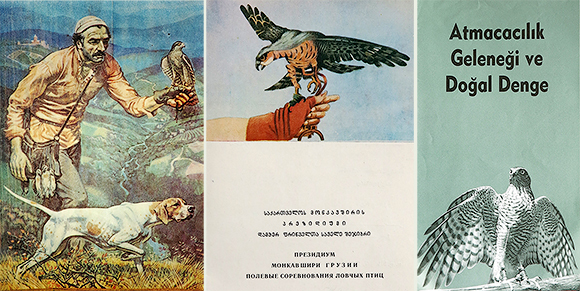 This included the initiation of systematic bird counting, the production of educational materials – including a beautifully illustrated Georgian raptor identification guide (Gálvez et al. 2005) – and motivation for the protection of raptors to the environmental authorities. The first edition of the raptor identification guide for the Caucasus was produced with illustrations by Dutch bird artists, including Erik van Ommen. More systematic, organised and well-supported counts by a group of young Belgian ornithologists started in 2008 and revealed to date that an estimated million migratory birds pass the Batumi bottleneck during the fall (Verhelst et al, 2011; → Batumi Raptor Count where the current tally is kept). In spring the number of birds through the Batumi bottleneck is much less, perhaps due to alternative and more diffuse routes across the Caucasus from wintering to breeding grounds. 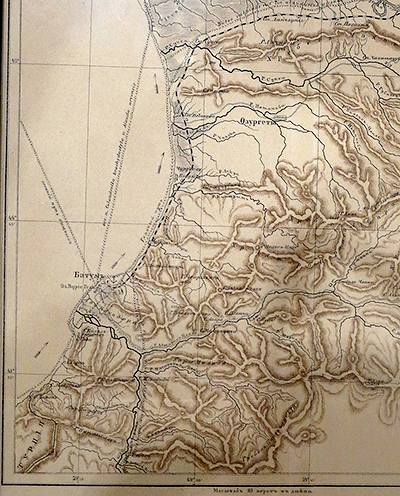 The first map of the flight patterns (>>>>) of raptors along the coast and in the foothills of Batumi, produced by the Polish naturalist Villkonskii (1897). This map corresponds quite well with the flight patterns (depending on the weather and cloud cover) observed today. Very little is known about the origins of many of the bird species, particularly those from the Eastern Palearctic. We do know for instance, from recovery of rings, that Honey-buzzards from Fenno-Scandinavia pass through. 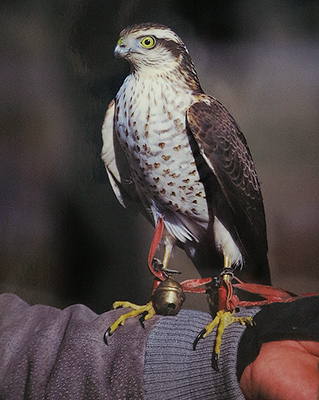 A very pale juvenile sparrowhawk at the regional Falconry Competition at Chokhatauri, 24 October 1999. Falconers like to catch and display “odd” birds, which is an event during the competition. Whether this is an oddity (partial leucism) or a bird from a distinct sparrowhawk population somewhere in the Eastern Palearctic remains unclear or equally plausible. However, there is much more to learn about the biogeography of the birds and the differential migration of cohorts of age and gender. New techniques like the analysis of stable isotopes (isotope ecology) and satellite telemetry may present novel research opportunities. This may reveal new information about migratory biology, as well as the range and population ecology of species, not to forget new insights into the state of the environment with respect to land use changes and the effects of climate change within the Western and Eastern Palearctic. Young and old participate in the indiscriminate shooting and trapping of migratory birds. These kids (Makhindjauri, August 2007) didn’t think twice about shooting passing birds, from barn swallow to Lesser spotted eagle; even Common cranes and Black storks are shot without hesitation! 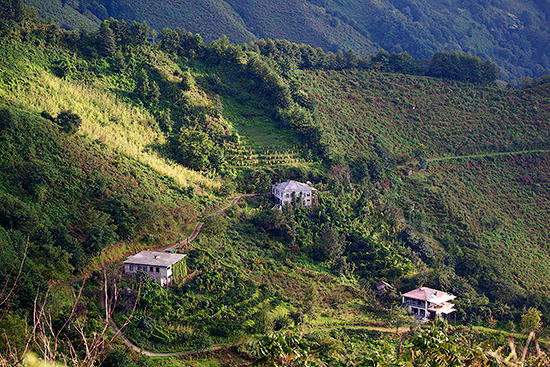 The views of the raptor migration in the foothills of the Adjarian Mountains, including hilltops like in the village area of Machindjauri and Orta Batumi, just north of the harbor city, are nothing less than spectacular. For example, on 24 September 2012, in Orta Batumi and close to the Mtirala National Park, during a warm clear day just after a few days of rain, hundreds of Honey buzzards, steppe buzzards, Black kites and Marsh harries could be seen rising on the thermals and then gliding south; wave after wave. Among them tens of Pallid harrier, Booted eagle, Short-toed eagle, Lesser-spotted eagle, Levant sparrowhawk, kestrel and an occasional Red-footed falcon. Specialties during that day were several Imperial eagles (a group of three), Long-legged buzzard and a Dalmatian pelican (!). 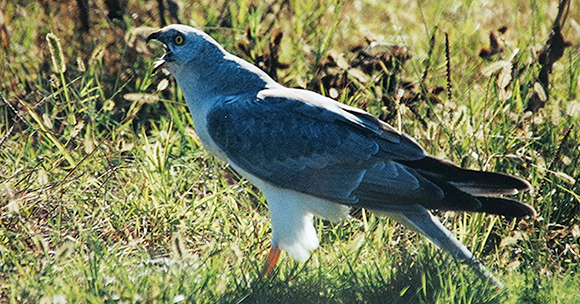 Adult male pallid harrier Circus macrourus feeding on a lark in the Chorokhi Delta, just south of Batumi (fall of 1999). Unfortunately the joy of watching the continuous flow of migratory birds in the Batumi foothills and in the Chorokhi can be spoiled by hunters, who shoot a large number of low flying raptors of all sorts, and also other migratory birds. In fact they shoot at everything flying within range, mostly for sport and fun. 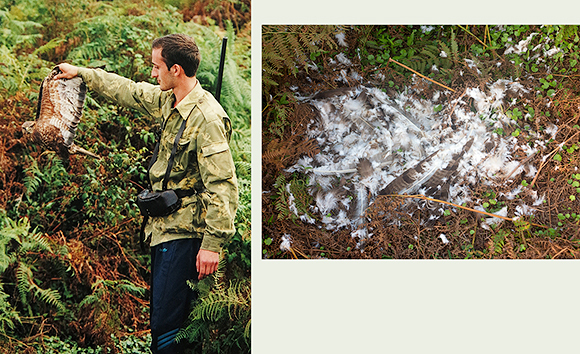 Above – Left: Hunter with a Steppe buzzard Buteo buteo vulpinus he just shot (Makhindjauri, fall of 1999). Right: Remains of a shot Honey-buzzard at Makhindjauri in the fall of 2012. Some hunters eat Honey-buzzards Jajia as a delicacy, but the other raptors Irao are regarded as distasteful. The killing fields are apparent with the scattered remains of birds ripped apart around hunting and trapping huts on certain ridges and hilltops near Batumi. The practice and is reminiscent to the bird shooting in Malta (Fenech 1992). Beside the hunters in the hills are the falconers, who trap juvenile Eurasian sparrowhawks and goshawks to train for falconry activities in the late fall (Van Maanen et al. 2001). The raptors are caught using a blinded Red-backed shrike as lure behind a sail-shaped net. 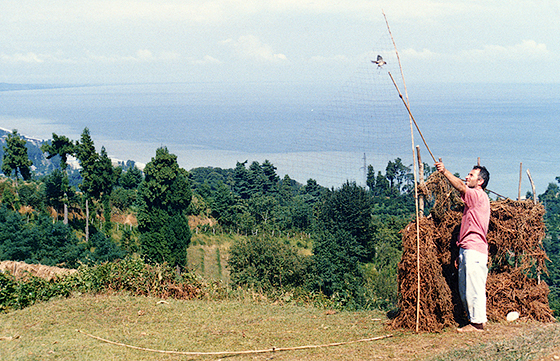 As soon as a low flying raptor approaches, the falconer lets his decoy – a shrike – dance in the air and whistles to lure the unsuspecting raptor (usually a sparrowhawk) into the sail-shaped net (Makhindjauri, fall of 1999). Occasional by-catch such as Levant sparrowhawks, kestrels and hobbies, and even a disproportional number of rarities or less-tempted birds like Pallid, Ferruginous harrier and Short-eared owl, are regarded as useless and killed to feed the birds kept for falconry, as their remains around the trappers huts show. Only rarely a highly prized Peregrine or Saker falcon is caught. There is also talk of a very rare and special “white falcon”, which could refer to a pale version of a Tundra peregrine falcon Falco peregrinus calidus. A falconer taking a sparrowhawk triumphantly from the net. Falconry activities include mainly the hunting for quails and corncrakes and participation in several falconry competitions. Falconry is an age-old tradition in Georgia, shared with counterparts on the Turkish coastline from Sarpi to around Trabzon; where, however, the mistreatment of raptors is perhaps curtailed these days instead of unregulated like in Georgia. The prized possession of Merabi the falconer (Saghalvasho, September 2012). Left to right: blinded Red-backed shrike (Lanius collurio) or Ghazho used as the prime decoy to catch raptors; a captured sparrowhawk (Accipiter nisus) or Mimino on display; a juvenile Northern goshawk (Accipiter gentiles) or Kori in the regional falconry nomenclature. This bird was recently taken from a nest in Guria and habituated well to its owner. It is estimated that between 3000-7000 raptors die (Van Maanen et al. 2001a and pers. comm. J. Janssen) from the shooting, trapping and falconry each year in Georgia, not counting the birds that are taken from nests in inland Georgia, including falcons, eagles and vultures. 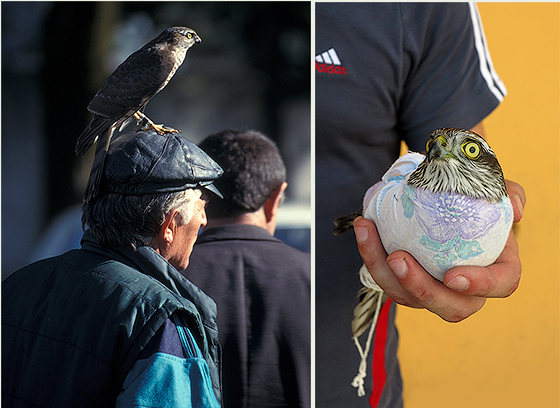 Display of Mimino during a falconry competition in 1999 (left) and a young falconer with a sparrowhawk just bought from a trader in the centre of Batumi in September 2012. Unfortunately and despite the intended accession to the European community, the ban on, or rather the enforcement of environmental law regarding the protection of migratory birds and other biodiversity or natural assets, still needs to be effectuated in Georgia, and on many other fronts as well. The trapping of raptors – as still practiced today in Georgia, Turkey and some places in the North Africa and the Middle East – was once also a similar and fairly common practice in Northwestern Europe. This old image (19th Century) shows the spring-trapping of falcons and other raptors on migration in an area (Valkenswaard) of the Netherlands, using a Great grey shrike as decoy. Fenech, N. (1992) Fatal flight: the Maltese obsession with killing birds. London: Quiller Press. 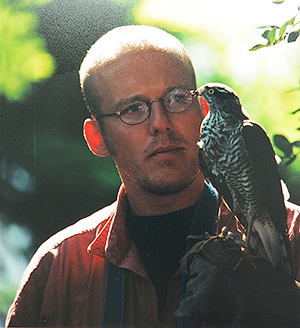 The author (Erwin van Maanen) with a sparrowhawk bought from trappers for release. Around 30 birds where recovered from trappers and freed in the fall of 1999.